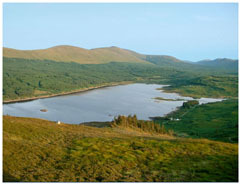 Loch Doon is a major reservoir for Ayrshire and is a Site of Special Scientific Interest because of the Arctic Charr which breed there. It is 9km long and set high in the Ayrshire part of the Galloway hills. The beautiful vistas of moorland and forest attract the outdoor enthusiasts – walkers, cyclists, fishers, picnickers and, of course, birdwatchers. The surround hills provide some of the best hill walking in Ayrshire and much of the land is managed by Forest Enterprise and is accessible to the public via a network of forest trails. From the A713 Dalmellington-Castle Douglas road, 2 km SE of Dalmellington,take the byway signed to Loch Doon. Buses pass this road end regularly. It is a long walk in along the byway but excellent cycling. After the initial climb to the north end of the loch, the byway runs attractively along the west bank past grassland, scrub and moorland with patches of woodland. There are many possible stopping places and a number of tracks onto the moor. Beyond the public roadway, forest tracks lead on for walkers and cyclists – one is a signed cycle route through the hills to Barr and Straiton in South Ayrshire. Narrow country road. 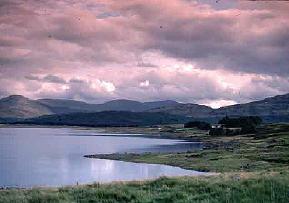 View loch and surrounds from car parks or park by verge. No safe refuges for wheelchair users to avoid passing traffic. The reservoir’s stony shore has limited life, though Grey and Pied Wagtail and Common Sandpiper are regulars. The waters may have Goosander, Merganser, Goldeneye, Tufted and other duck. On the moors are Meadow Pipit, Stonechat, Grasshopper Warbler, Wheatear and Skylark . Peregrine, Buzzard and Raven may be overhead and a glimpse of hunting Merlin may be had. There is an easily accessible track onto the lower slopes of Craiglee Hill, just behind the remains of Loch Doon Castle (NS 484 951) where all four of these species can be seen regularly. Early-rise birdwatchers should look out for the Blackcock leks in season. The pine and mixed woodlands have appropriate species, including Goldcrest and Crossbill . This entry was posted in Locations - East Ayrshire on 28-Jul-2003 .